Sion “Brummie” Scone divulges the throwing routine that GB Open started using back in 2011. Last year, Dan “Colonel” Furnell and I put our heads together in order to come up with a throwing routine that we felt stressed the most important throws; having spent the previous two years teaching throwing skills to GB Open, we took the bits from Burruss’ KFT that we found most useful, added/tweaked a little (including some of Wiggins’ Zen Throwing), and split into four chunks to make it easier to fit them in before or after other practices or fitness sessions. Each should take in the region of 20 mins, probably slower the first few times you try them until you know the routines. 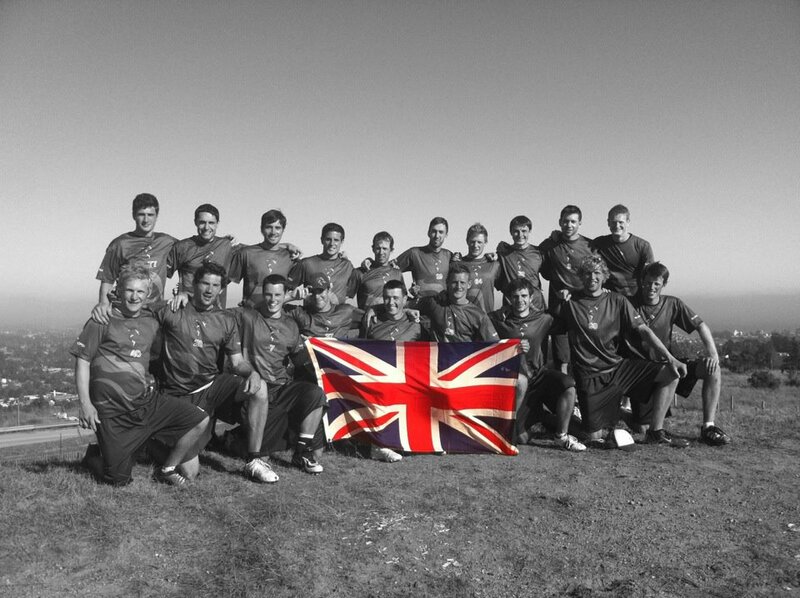 GB Open 2010-2012. Photo Courtesy of Dominic Clark. If you’re going out just to throw, then make sure you warm up. Jog a lap with your partner, throwing the disc back and forth. No further than 2m, catch it as you caught it, minimise the amount of time that the disc is in your hands, and make sure it spins when you throw it! Try mixing this up by aiming to the receiver’s left hand, or right hand, as well as hitting them in the gut. One set of each is ideal. 4. Catch-and-throw: complete 10 backhands, then 10 forehands, where you need to attack the disc and quickly return the disc to your partner. Make small cuts *just as your partner catches the disc*, so they can catch, see you move, and throw to you over a short distance. Distance will vary as you throw; when you get too close, “reset” your position via a lead pass away from you. *All throws must be thrown hard if thrown directly to partner; the exception is if you throw a lead pass*. Try to resist the urge to just move directly towards each other; change up the angles. Incorporate “Strobe Catches” if you want to make life more difficult while catching; essentially, blink fast while the disc is moving towards you, or – even better – blink *slowly* so that you are unsighted slightly and are able to adjust to the catch faster. 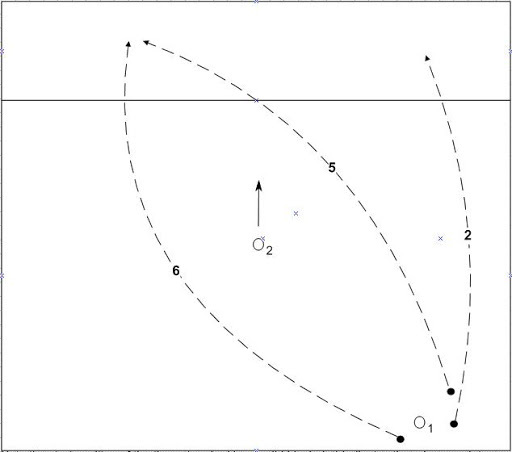 Below is a diagram that shows 1 hucking to 2; the numbered flight paths denote the throws above. 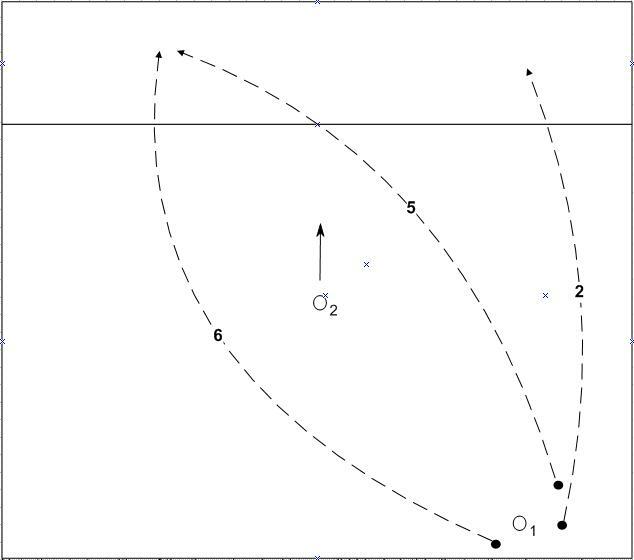 Not all are displayed; the thrower starts on the other sideline for the unmarked throws. Throws 1 & 2 are to the same 1/3 of the field as the thrower; 3-6 are to the far sideline. Note the start position of the throw (marked by a solid black dot) indicates the release point; pivot sideways for 2, pivot forwards for 5, pivot backwards for 6. Imagine your pivot foot is at the centre of a compass. This section is split into two parts, and for each you should stand offset to each other as shown below (where you are the player marked by the big arrow, your partner’s position is marked by the small arrow, and where your pivots in each part correspond to the compass points shown above it). For Part 1, your partner should be in a north east direction, for Part 2, your partner should be in a north west direction… You should be 10-15m apart. 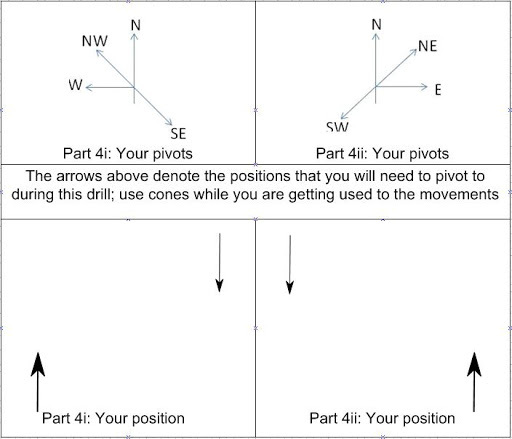 It can help to place cones at each of the points you need to pivot to, as you will want to be as accurate as possible on your pivots while you’re learning this routine. Optional: While your partner is throwing backhands, put out the hand that is furthest from them, and stick up some of your fingers. Get your partner to call out the number during the throw. Don’t show the fingers until they pivot to the backhand side, and the thrower should try to avoid pausing in this position. Fake, pivot, throw. You are working on a snap fake and quick grip transition. Speed is important, so try to push your limits as fatigue sets in while maintaining accuracy. You should therefore pivot and fake to the opposite side prior to each throw, and you are aiming to pivot *directly* from one side to the other, without needing to take an additional step in the middle of your pivot. In the diagram above, you are the big arrow, your partner is the small one. Face the direction shown, not each other. (NOTE: “Throw” is for a righty, reverse if you’re a lefty). Do Part 1 five times, then switch to Part 2. Get out there and get throwing! Brummie has more to say with commentary on Clapham’s recent performances coming soon … DP @ tSG. Brummie, shallow angle/steep angle? Would that be equivalent to inside-out/outside-in? For one-legged throws, why use the opposite leg? After a pivot the majority of your weight should be on the 'throwing' leg, so my intuition would be that that's the one to train (although it may raise concerns of training travels). There are next to no in-game situations where you'd want your centre of mass to be over the pivot leg (except maybe throwing a hammer)- even in situations when you're throwing as you move, the centre of mass is over your throwing leg, it's just not on the floor. Nope. Both outside-in. Shallow angle approx 30 degrees from horizontal, steep angle approx 60 (knife being 90). Steep ones go up and down faster, perfect for throwing around a poach into a cutting lane.